A long look at Ubisoft's chilly sports game. 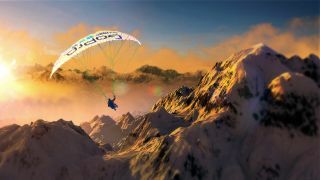 Ubisoft's Steep is a sports game about hurtling down mountains, using skiis, snowboards, wingsuits and via paragliding. That all sounds very extreme in all caps, but to me it looks curiously relaxing, that is if you ignore the distracting music playing in the background. Is Steep the game I've been looking for since Cool Boarders/that Final Fantasy 7 minigame? 15 minutes of footage have arrived to show me that the answer is a definite 'maybe'. That's Polygon showing off the snowboard and wingsuit (mainly) there, offering several minutes of the PC version for us to enjoy. As Tom notes in his E3 preview, Steep is a fairly minimalist, multi-discipline affair that you can play with your chums, or on your own. That sounds pretty good to me.